A cooking method by which food (usually meat or vegetables) is first browned in fat, then cooked, tightly covered, in a small amount of liquid at low heat for a lengthy period of time. The long, slow cooking develops flavor and tenderizes foods by gently breaking down their fibers. Braising can be done on top of the range or in the oven. A tight-fitting lid is very important to prevent the liquid from evaporating. And here's reason to join in: the kitchen smells soooo good while the carrots cook! And of course, yes, the carrots are delicious, imbued with a smoky luster. NEXT TIME I'll again cut the butter from 4 tablespoons to 1. Of COURSE, these carrots would taste still better with three more tablespoons of butter. But they were very good as is, rich enough for everyday weekends, if you know what I mean, and within my personal health-conscious guideline which allows for a tablespoon of fat per pound of vegetables. And honestly? They tasted plenty rich, as is. Melt the butter in a pan or skillet (choose carefully: it needs to have a tight lid and be able to just hold the carrots in no more than a layer or two; tonight a ten-inch skillet worked great) over MEDIUM heat but do not allow to brown. Stir in the carrots, coating them thoroughly with butter. Stir in the nutmeg and salt and pepper. Gently cook for about 2 minutes, "just to release the carrot flavor". Add the marsala, cover the pan and set the heat to maintain a bare simmer. Cook for about 15 minutes, checking every five minutes to stir and to ensure that a simmer is maintained and that liquid remains. (On my stove, with my skillet, this meant keeping the temperature just below MEDIUM.) If the liquid evaporates before the carrots cook, add small amounts of hot water to replenish. 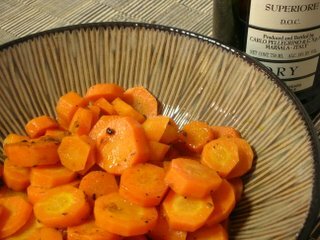 Once the carrots are cooked, if there's liquid left, increase the heat and burn it off. Season to taste (again -- it took considerable salt for my taste), serve and enjoy!